US President Donald Trump and his Ukrainian counterpart Petro Poroshenko met on the sidelines of the UN General Assembly to discuss peacekeeping mission to Donbass, the United States supplying lethal weapons to Ukraine. UNITED NATIONS (Sputnik) — Ukraine is making progress in expanding business opportunities despite the ongoing conflict in the country, US President Donald Trump said prior to the meeting with Ukrainian President Petro Poroshenko on Thursday. "Ukraine is coming along pretty well," Trump stated. "Companies are going very strongly right now into the Ukraine, they see a tremendous potential there." Poroshenko expressed gratitude to Trump and praised the countries' cooperation in military and economic sectors. 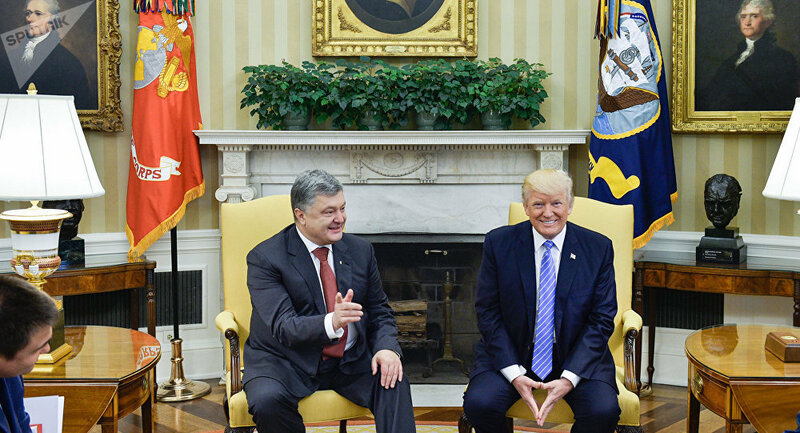 The Ukrainian president stated that during the meeting with US President Donald Trump expressed support for Kiev's proposal to deploy UN peacekeepers in eastern Ukraine as well as reforms carried out by Kiev authorities. "It is important that the United States fully supported Ukraine, my proposals, which were voiced in 2015 about the deployment of peacekeepers in the east of Ukraine…with a UN mandate," Poroshenko said after the meeting, as quoted by Ukrainian television. Poroshenko also said it was important to hear the full support of the reforms that were taking place in Ukraine and a positive assessment of the results that Ukraine had achieved through these reforms. "We agreed that our cooperation in supporting reforms will continue" the Ukrainian president stressed. The two presidents also discussed bilateral cooperation in the field of security. "The vision of a new level of Ukrainian-US cooperation in the field of security is very important. We thoroughly discussed all ways of expanding this cooperation, from the partnership with the West Point Military Academy that we visited several days ago to the cooperation with the US Defense Department and other institutions," Poroshenko said. The Ukrainian leader also expressed his satisfaction with the current level of bilateral cooperation. However, Poroshenko refused to answer a question whether he called on Trump to provide Ukraine military aid. In their meeting at the UN General Assembly, Trump and Poroshenko were expected to discuss the possibility of the United States supplying lethal weapons to Ukraine, as well as the issue of sending a peacekeeping mission to Donbass, according to Ukrainian lawmaker Irina Lutsenko.